Yuanmingyuan - "Garden of Gardens"
Yuanmingyuan was originally built in 1709, or the 48th year of the reign of Emperor Kangxi, whose reign of 61 years was the longest among all Qing monarchs. Repeated expansions conducted by his successors, emperors Yongzheng and Qianlong, resulted in an imperial garden of unprecedented scale. Yuanmingyuan covered an area of 350 hectares and consisted of Yuanmignyuan, Changchunyuan and Qichunyuan, which were collectively known as Yuanmingyuan. Its surface structures covered exactly the same floor space as the Former Imperial Palace, while its water surface was as large as the entire Summer Palace. During the Qing Dynasty, emperors Yongzheng, Qianlong, Jiaqing. Daoguang and Xianfeng had all lived in this garden on a permanent basis. While they enjoyed life there, they also handled state affairs. Like the Forbidden City, Yuanmingyuan became another political center of China. For this reason it was also known as Imperial Garden. It was a man-made cultural phenomenon unseen elsewhere in this world. The southern part of the garden was where emperors handled state affairs, while the other parts were studded with more than 150 scenic spots, which comprised exquisitely constructed halls, pavilions, chambers, kiosks, earth and rock hills, rivers and ponds, and exotic flowers and strange trees from different parts of the country. It was, indeed, a museum of garden construction and horticulture. Many of the country's famous scenic spots were imitated in Yuanmingyuan. During his many tours of the country, Emperor Qianlong made it a point to have pictures of famous gardens and scenes drawn so that he could have replicas built in Beijing. Most famous of these were the ten scenic spots of the West Lake of Hangzhou. Yuanmingyuan was not only in the possession of vast expanses of water, but also a maze or rivers and streams. It was also studded with 250 man-made hills. These hills, water surfaces, pavilions and terraces, corridors, isles, dykes and bridges, combine to partition the entire place into more than 100 scenic spots each looking unique in its own way. The result was that the garden was evocative of the picturesque area south of the Yangtze River. Yuanmingyuan differed from other classical Chinese gardens in that its typical Chinese scenery was mingled with Western architecture. Most famous of these were the Throne for Viewing the Waterworks, the Grand Waterworks, and the Labyrinth. Designed by Girseppe Castiglione and other Western missionaries and constructed by Chinese artisans, they were rich in the style of Italian renascence. With a model of Venice built on the lake, the emperor could marvel at the scenery of the world-famous water-bound city without going outdoors. Yuanmingyuan was also an imperial museum that housed a vast horde of treasures, books and cultural artifacts. It was a colossal botanical garden as well, having been planted with millions of precious trees and flowers. It was pity that Yuanmingyuan was sacked during the invasion of Anglo-French Allied forces in 1860 and again during the invasion of the Eight-Power Allied Force 1900. The buildings were burned to the ground, and the treasures in it were rooted. A world-famous garden was thus reduced to ruins. This was a catastrophe in the world history of civilization. 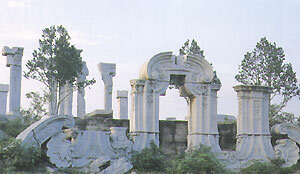 Today the ruins of Yuanmingyuan have been put under due protection. A park was established at the site so that from the crumbling walls and ruins people could gain some idea about the former glory of this imperial garden. Luxurious woods and sparkling lakes and ponds combine to create a scene of captivating beauty. Some of the original structures and scenic spots have been restored. Yuanmingyuan has become a place for people both to relax.